The FIG Christchurch Declaration is the 68th publication in the FIG Publication series with the sub title: Responding to Climate Change and Tenure Insecurity in Small Island Developing States - The Role of Land Professionals. 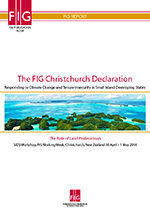 FIG is proud to launch the latest publication in the FIG Publication series: The FIG Christchurch Declaration - Responding to Climate Change and Tenure Insecurity in Small Island Developing States - The Role of Land Professionals. The publication is a result of the SIDS Workshop that was held during the FIG Working Week in Christchurch, New Zealand 30 April – 1 May 2016. The Workshop was organised in cooperation with GLTN, FAO and NZ-Aid. The authors of the publication are David Mitchell, Stig Enemark, Tony Burns and Bill Robertson who have worked with the challenges of the Small Island Developing States for a number of years. The theme of the workshop and this publication is in the heart of the new 2030 Agenda for Sustainable development. The agenda includes 17 goals, with 169 targets and about 240 indicators. The first workshop was held during the FIG Congress 2010 in Sidney, which was followed up with a conference in Fiji in 2013. The FIG Christchurch Declaration will hopefully serve as a guiding document for the land professional in SIDS in facing the challenges of the future. FIG is committed to support this process. The workshop in Christchurch 2016 and the resulting declaration emphasised the way and means for land professionals to address climate change, natural disaster and urbanisation challenges and vulnerabilities; address the challenges in land governance and administration; and, for this purpose, build capacity in land governance and administration and enhance professional and organisational collaboration. Minutes from FIG General Assembly.